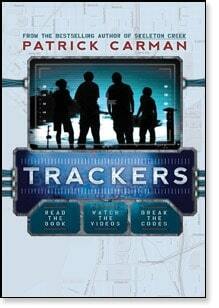 I like books that are bit different than the things I normally read so I was interested to check out the book Trackers (Book 1) by Patrick Carman . Promoted as a book for kids in Grades 5 to 9, I thought the premise sounded really interesting because it combined the story in the novel with videos online to augment the story. At various points, as the story is being told, there are video clips you can watch online to add another dimension to the story (there are also transcripts in the back of the book in the event that you are reading this book and you don’t have internet access). The story revolves around a group of friends that are lead by Adam, a young man who has some serious tech skills. The others in the group – Lewis, Emily and Finn – all have their own set of skills they have developed but, ultimately, they follow the Adam’s lead. The majority of the book is in the form of an interview. Adam is being interviewed by someone who wants to know what has happened to lead the Trackers down a troubled path. Adam outlines his relationship with his group and how he has developed the surveillance equipment that that Trackers use. It is obvious that he never thinks that, as a Tracker, he and the others might end up becoming the hunted. A number of questions arise when reading the book that are unanswered – who are the people interviewing Adam and how is this story going to end? It has an abrupt ending, which I’m assuming was chosen so that readers want to continue on with Book 2. I thought the premise of this book was interesting, but it wasn’t really a book for me. That being said, I think that many kids in the 10-14 year old range would really like it. The integration of the online videos (which I thought were well made) to the story would make it appealing to many readers. As well, I think that a youth reading this book would not be as bothered by the fact that the reader doesn’t know who is interviewing Adam and the fact that the story ends abruptly. I think thatÂ Trackers (Book One) would be a great book for youths that are interested in technology and enjoy books with characters their own age. I think this combination of internet videos and a novel could also beÂ way to draw in kids who are reluctant readers because it does stand apart from traditional novels. Great book for my curious nephew.